When women are passing through the menopausal transition, various symptoms may evolve that they never had prior issues with due to drastic hormonal fluctuations, including symptoms affecting the gastrointestinal tract. Discover more about what to take for bloating to finally liberate your guts and allow for enjoyable, well-digested eating. What can I take for bloating? Activated charcoal. This supplement works to reduce bloating symptoms when taken before and after a meal. However, its consumption is not extremely desirable due to the fact that it can interfere with medication absorption and can stain clothing as well as inside of the mouth. Fiber supplements. Although best consumed in food, fiber supplements can be taken for stomach bloating to prevent constipation that may be causing the gas. Nevertheless, they may decrease absorption of medications, reduce blood sugar levels, and cause bloating initially. Probiotics. Probiotic supplements function by changing bacterial flora in the gut that is responsible for producing gas that causes bloating. They are naturally found in yogurt but can also be consumed as supplements. Enzymatic supplements. Alpha-galactosidase (as found in Beano®) is a sugar-digesting enzyme that breaks down complex carbohydrates. Also, over-the-counter lactase supplements aid with digestion of sugar in dairy products for those who are lactose intolerant. Antacids. You can also take antacids for a bloated stomach. Antacids contain simethicone, an anti-flatulent agent that reduces the surface tension of air bubbles, allowing for easier elimination of gas. Consumption is recommended for after meals and at bedtime. Phytoestrogenic herbal supplements. These supplements, such as black cohosh and chasteberry, contain phytoestrogens, plant-based estrogens, which may help alleviate bloating by complementing low estrogen levels in a woman's body, thus curing the underlying cause of the symptom. Hormone-regulating supplements. These, such as Macafem, nourish the endocrine system to encourage natural hormone production. Because they don't introduce any exogenous hormones into the body, they can be considered of the safest options to promote hormonal balance. Some diet considerations are to eliminate any fried or fatty foods, carbonated beverages, dairy, and high-fiber, healthy foods recognized for causing gas. They include beans, Brussels sprouts, cabbage, asparagus, and more. Also, regularly exercising reduces the likelihood of constipation, which prevents gas release from the colon. Finally, practicing healthy habits, which decrease the amount of air swallowed, includes quitting smoking; avoiding chewing gum and drinking through straws; and not talking while eating. 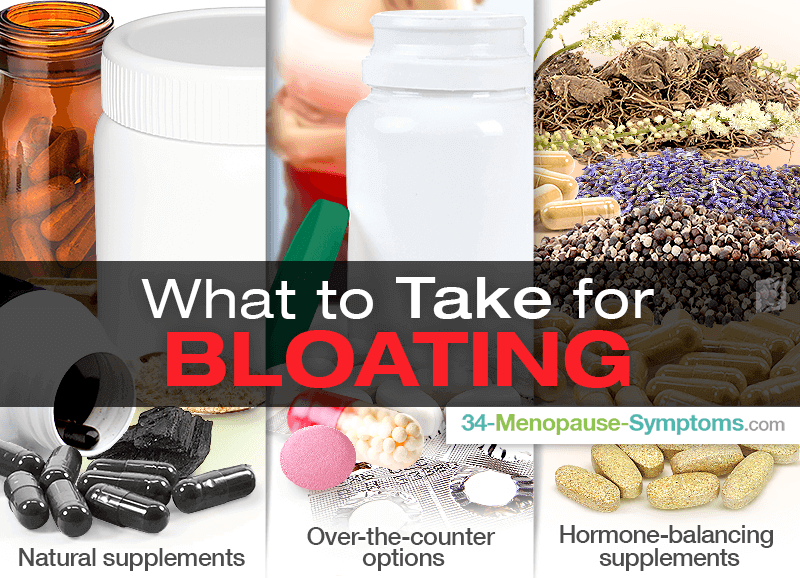 When considering what to take for bloating, women have various options available as bloating treatments, from natural and over-the-counter supplements to those that go directly to the root cause and cure it, hormone-balancing supplements. For best results, it I s wise to keep in mind some tips that reduce bloating, such as eliminating gas-promoting foods, regularly exercising to promote peristalsis, and engaging in habits that decrease the amount of air swallowed. Bloating is a common symptom of menopause and is an unpleasant experience, leaving some women feeling sluggish and self-conscious.